Figure 11.1 from the text shows the anatomy of a long bone. 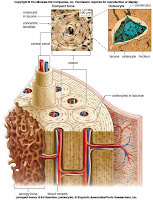 v. epiphyseal (growth) plate - band of cartilage between primary & each secondary site. Figure 11.7 from the text shows the bones of the human skull. Figure 11.8 from the text shows the facial bones and the hyoid bone. Figure 11.9 from the text shows the vertebral column. Figure 11.11 from the text shows the bones of the pectoral girdle and the upper limb. 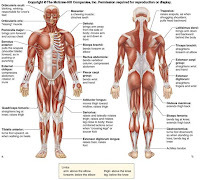 Figure 11.13 from the text shows synovial joints. Figure 11.14 illustrates synovial joint movements. Definitions for Chapter 11 can be found here. 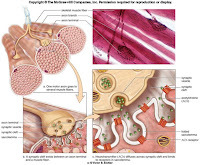 Figure 12.5 shows skeletal muscle fiber structure and function. iii. 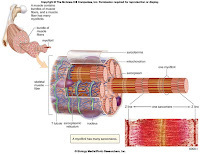 sliding filaments - contraction of muscle fiber starts when calcium released from sarcoplasmic reticululm. 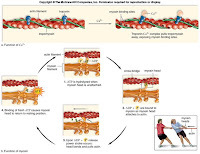 Figure 12.6 from the text illustrates the neuromuscular junction and Figure 12.7 shows the function of calcium and myosin in muscle contraction. Figure 12.11 shows fast- and slow-twitch muscle fibers. 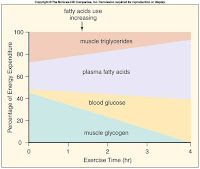 Figure 12.9 shows the fuel sources for muscle contraction during submaximal exercise (65-75% of effort) and figure 12.10 shows the 3 ways that muscles product ATP. 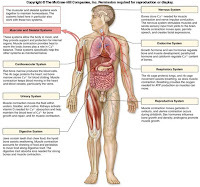 Figure 12.12 shows how systems of the human body work together. Definitions from Chapter 12 can be found here.